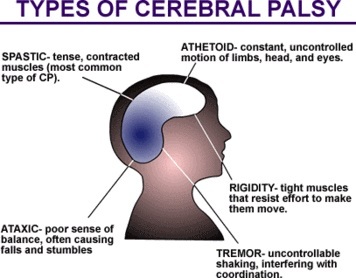 Cerebral palsy (CP) is an umbrella term encompassing a group of non-progressive, non-contagious motor conditions that cause physical disability in human development, chiefly in the various areas of body movement. Cerebral refers to the cerebrum, which is the affected area of the brain (although the disorder most likely involves connections between the cortex and other parts of the brain such as the cerebellum), and palsy refers to disorder of movement. However, "paralytic disorders" are not cerebral palsy — the condition of quadriplegia, therefore, should not be confused with spastic quadriplegia, nor Tardive dyskinesia with dyskinetic cerebral palsy, nor diplegia with spastic diplegia, and so on. Cerebral palsy's nature as an umbrella term means it is defined mostly via several different subtypes, especially spastic, and also mixtures of those subtypes. Cerebral palsy is caused by damage to the motor control centers of the developing brain and can occur during pregnancy, during childbirth or after birth up to about age three. Resulting limits in movement and posture cause activity limitation and are often accompanied by disturbances of sensation, depth perception and other sight-based perceptual problems, communication ability, and sometimes even cognition; sometimes a form of CP may be accompanied by epilepsy. CP, no matter what the type, is often accompanied by secondary musculoskeletal problems that arise as a result of the underlying etiology. Spastic cerebral palsy is by far the most common type of overall cerebral palsy, occurring in 70% to 80% of all cases. Moreover, spastic CP accompanies any of the other types of CP in 30% of all cases .